Douglas College alum Steve Hanson has made a slam dunk, snagging the title of head coach for SFU’s men’s basketball team. A graduate of Douglas College’s Bachelor of Physical Education and Coaching program, Hanson was named to the position on May 25, after more than a decade of coaching the Terry Fox Secondary Ravens. Hanson was also the lead assistant coach on the SFU Clan’s past season and has been interim head coach of the program since April 7. Hanson says the gig comes with its challenges. As the only Canadian team in the National Collegiate Athletic Association, problems can come up when playing in an American league with American rules. Adding to that are SFU’s high academic standards. Despite the obstacles, Hanson is setting big goals. The 41-year-old aims to win a Great Northwest Athletic Conference and become the first-ever SFU men’s basketball team to make it to the NCAA championships. Fortunately, for the team, Hanson has the resume to back up his sky-high goals. 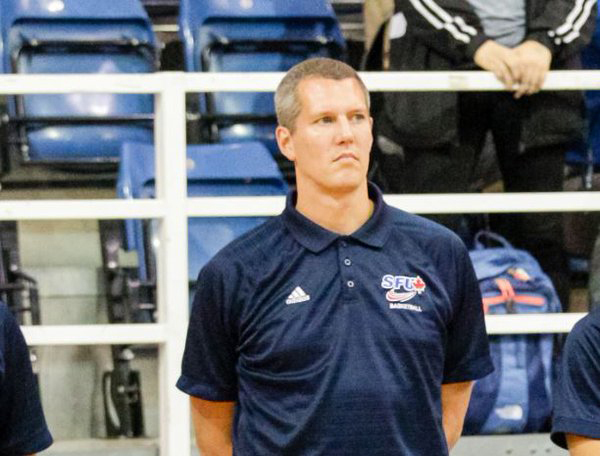 He was head coach of the Canada Basketball Centre for Performance program, coaching with the 3D Basketball Academy and his Level 3 certification from the National Coaching Certification program. For six years he worked with players in the NFL, CFL and NHL as a speed and strength specialist with Gridiron Sports Development. While coaching at Terry Fox Secondary, Hanson decided to take his career to the next level with post-secondary education in 2007. That led him Douglas to enroll in the BPEC program as a mature student, graduating in 2011. He followed that up with a Bachelor of Education from SFU in 2013.